Historically, my players have been very afraid of running out of food in the wilderness. This seems like a pretty reasonable concern. For ready reference, here is a summary of the scattered RAW on rations and foraging and such, as well as a discussion of some implications and potential houserules. Each day, characters must consume food and drink weighing a total of one stone. This assumes 2lb of food and 1 gallon (8lb) of water. Failure to consume enough food does not significantly affect a character for the first two days, after which he loses 1 hit point per day. Furthermore, at that point the character loses the ability to heal wounds normally, though magic will still work. Eating enough food for a day (over the course of about a day, not all at once) restores the ability to heal, and the character will recover at the normal rate. Inadequate water affects characters more swiftly; after a single day without water, the character loses 1d4 hit points, and will lose an additional 1d4 hit points per day thereafter; healing ability is lost when the first die of damage is rolled. When in the wilderness, characters can hunt or forage for food. Foraging for food is an activity that can be accomplished without hindering travel by gathering fruits, nuts, and vegetables. For each day of travel while foraging, a character should attempt a proficiency throw of 18+ on a d20. A successful result indicates that sufficient food for 1d6 man-sized creatures has been acquired. Hunting succeeds on a proficiency throw of 14+ and indicates that sufficient food for 2d6 man-sized creatures has been acquired. However, hunting must be engaged in as the sole activity for a day with no traveling possible. In addition, there will be one wandering monster check, from the table appropriate to the terrain, while the group is hunting. Characters with the Survival proficiency gain a +4 bonus on their proficiency throws to hunt and forage. While on sea adventures, characters must consume food and water as described under Wilderness Adventures, above. Rowers must consume 3 gallons of water per day rather than the standard 1 gallon, so their supplies have an encumbrance of 3 stone per day. Standard rations are perishable and inedible after one week, so on long sea voyages most characters will eat iron rations. After one month at sea eating iron rations (that is, without eating fresh fruit, onions, or potatoes), characters begin to suffer from scurvy. Characters with scurvy lose 1 point of Str and Con each week. If either ability scores zero, the character dies. A scurvy-stricken character regains 3 points of Str and Con each week he eats fresh food. Characters can fish if the ship is becalmed or otherwise anchored. For each day of fishing, each character may attempt a proficiency throw of 14+ (gaining a +4 bonus if the have the Survival proficiency). A successful result indicates that food enough for 2d6 man-sized creatures has been caught. The character is an expert in hunting small game, gathering fruits and vegetables, and finding water and shelter. The character forages enough food to feed himself automatically, even when on the move, so long as he is in a fairly fertile area. If he is trying to supply more than one person, he must make a proficiency throw (as described in Wilderness Adventures), but gains a +4 bonus to the roll. Page 46 notes that iron rations last spoil after two months in the wilderness, or a week in the dungeon, while standard rations last a week in the wilderness or a day in the dungeon. Iron rations cost 1-6gp per week, while standard rations cost 3sp-3gp/week (a rather weird range). A final thing to note in all of this is ACKS' natural healing rate. Per page 105, "For each full day of complete rest in reasonably sanitary conditions, a character or monster will recover 1d3 HP. If the rest is interrupted, the character or monster will not heal that day." There is no natural, universal overnight healing from normal rest, that I can find. This casts the Healing proficiency into ambiguity: "A patient under treatment of Healing naturally heals an extra 1d3 hit points each day." Presumably (and I think we've been playing it this way), that applies to bed-rest healing, rather than providing overnight healing. I think there's also an argument to be made that the Cure spells that Healing grants are also intended to be applied to bed-resting patients, rather than as first aid (with the exception of Neutralize Poison, which requires expeditious use, and Comfrey, which is explicitly marked for use "after a battle", and notably tracks usage separately from "patients"). This interpretation is supported by the "Campaign Play" article, published in Axioms on 6 Sept 2016, which lists Healing as a "major" activity, or around six hours of work a day to care for 3/4/5 patients - consistent with "patients" being people under bed rest (but see here for counterpoint... but that leads to some really weird interpretations with healing fading when you switch patients, which doesn't make any sense at all). The Cure Light/Serious functions of Healing should be surgery - that's why Healer 3 NPC specialists are "chirurgeons". So that's very interesting - I expect we'd still see Healing 1 a lot in dungeoneering play, for the mortal wounds bonus and Comfrey use, but Healing 2 and 3 would be much rarer under this interpretation. What would our mages do with all those general proficiencies freed up from Healing, I wonder? Some actual wizard-knowledge, perhaps? Your average character forages successfully 15% of the time (about one day a week), and finds on average enough food for 3.5 characters. In expectation, you will tend to find about half a man-day's worth of food per day, without Survival, while traveling at full speed. Obviously, this is somewhat swingy, but with more characters will tend to average itself out. Depending on how you interpret the starvation rules, this may make starvation quite difficult for large parties. If starvation's effects only trigger after two consecutive days without food, and a large party tends to find half a man-day of food per forager, each character can (on average) eat every other day and avoid starvation indefinitely. Granted, this might not be great for morale (UPDATE: see here); I also recommend not ordering pizza during such sessions, to get players in the right mindset. With Survival, that increases to 1.22 man-days of food per day. The fact that survivalists can always feed themselves without a roll is also a nice bonus, both because it is reliable and because it reduces the amount you have to carry on expeditions when you are carrying rations. Hunting yields 2.45 man-days of food per hunter*day in expectation, or 3.85 with Survival, but it also costs a man-day of rations per hunter to execute, since it takes a full day without travel. If the party is traveling along rivers or camped by a lake, fishing is a safer option than hunting, with equivalent yields but no additional random encounter roll. For mid-level characters, starvation can take a very long time. A 5th-level mage averages 12.5 HP, and can go two weeks without food (a bit lower than the "three weeks without food, three days without water, three minutes without air" rule, but that's d4 HD for you). In those two weeks, you will in expectation find food by foraging twice, which on average buys you roughly a week of not-starving (plus four additional days of "not significantly affected" per success). But wait, that week of not-starving buys you an extra 5.5 days of not-starving in expectation, which buys you an additional ~3 days of not starving, which buys you an additional... there's a recurrence here. This is a somewhat annoying recurrence. I've poked at it with math for a bit, and I think the easier solution is probably Monte Carlo models. Basically you run a bunch of trials (like, 100,000) and observe the outputs statistically. Turns out the 5th-level mages survive, on average, about 28 days, with a long tail on the distribution. The longest-surviving mage lived off the land for one hundred and thirteen days with no healing, with strictly-decreasing HP, before starving to death. This is just foraging, with no bedrest. I did roll HP randomly per mage, but none of them had a Con modifier. 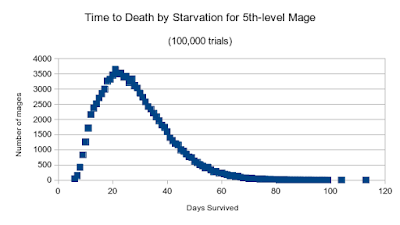 12% of mages had perished at the 15-day mark, 25% at the 20-day mark, 50% at the 27-day mark, 75% at the 36-day mark, 90% at the 46-day mark, and 99% at the 66-day mark. 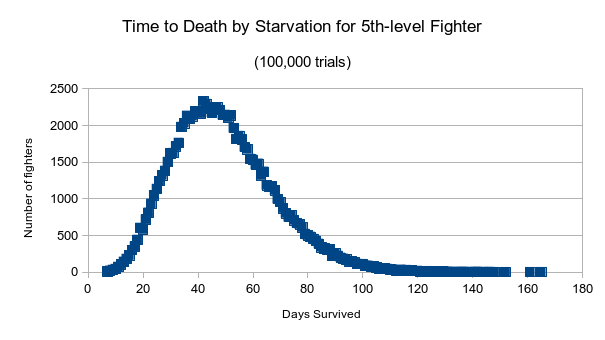 Fighters, as expected, live longer - 49 days on average, 165 days maximum. Again, that's with no healing. These guys had at most 40HP, but about 2.5 percent of them survived 4 months or longer. 10% had perished at the 28-day mark, 25% at 37 days, 50% at the 48-day mark, 75% at 62 days, 90% at 75 days, and 99% at 101 days. ... well that got rather grim, didn't it? The bottom line, though, is that two weeks without rations is less dangerous than the average dungeon crawl, with 12% wizard casualties and less than 1% fighter casualties. Henchmen might have a rougher time, though a 3rd-level fighter henchman would have superior HP to a 5th-level MU, on average, and should endure starvation comparably. And again, that's with no healing, no magic, no survival proficiency, no cleverness, no law of large numbers on multiple party members, nothing - pretty much the worst case, minus monsters. That's also time that you can spend traveling (hopefully home), because you can forage on the move. Starvation kills low-level characters very quickly, but is much slower for mid-level characters. This feels like it could be a very reasonable tension-maintenance mechanic for the wilderness levels, much like torch-counting is at low-levels. If you assume drinkable water is available in the field, a man-month of rations is about 4 stone and 25gp. A mule can carry 10 man-months of rations at 60' speed. The requirement to carry water makes deserts, swamps, oceans, frigid wastelands (where there is water but not fuel for fire to melt it), and high mountains much more difficult logistically, since then you're looking at 40 man-days per mule at 60' speed (or 20 at 120'). This also links nicely to Create Water. If you want to keep water relevant in less-hostile environments, having a roll per-week to avoid contracting dysentery (with effects similar to starving or dehydration (no natural healing, HP loss per day), but requires Cure Disease or a series of saves to remove) when you drink local water seems reasonable. We've been playing Healing very wrong, but it's still decent in the wilderness game. Taking a day of bed rest is not a huge deal - you already need to take a day of rest per week. If you set up a camp with tents, fires, and a clean water source, "reasonably sanitary" seems plausible to me. A sixth level cleric can do five Cure Lights and one Cure Serious per day, for a total of 7d6+11 HP of healing (35.5 points in expectation). A guy with Healing 3 can heal 5d3 HP on resting patients, plus five shots at Cure Serious, each with a 35% success rate (before herbs), or about 1.75 Cure Serious per day. It's unclear what the caster level for Cure Serious from Healing is, but that's at least another 3d6, for a total expected healing of 22.25 before any caster level bonus. That's at least 63% of a cleric (on a rest day). Great compilation of wilderness survival rules! In my experience, one foraging roll per pc per day while traveling through temperate climate regions was too much foraging, players almost stopped eating rations. So I changed it to one foraging roll per party per day. Thanks! One option I considered was having foraging slightly reduce overland movement speed, to create a tradeoff and a choice when planning expeditions.